You might have heard about big changes coming to the ACT® university admissions test. Starting in September, all non-US students will take the test in computer-based testing (CBT) format. Faster scoring. With the paper-based ACT test, you’d have to wait four to six weeks to get your scores back. With computer-based testing, you’ll get ACT scores back in two or three business days. Why that’s great: You can plan your future faster! Whether it’s determining if your scores are high enough to get into the university you want to attend, or you want to make plans to study hard and raise your scores, you can get started much earlier. More opportunities to test. Computer-based testing allows ACT to administer the test more often and in more locations. Previously, ACT offered five testing opportunities to international students per year. 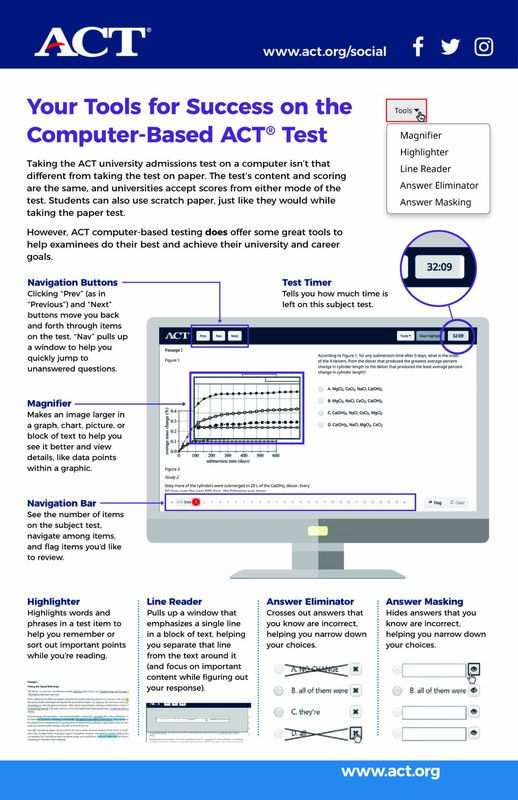 With computer-based testing, ACT can offer six testing windows, on Fridays and Saturdays, mornings and afternoons. Why that’s great: You get much more flexibility in planning your ACT test. Whether you’re a morning person or do your best work in the afternoon, or whether a weekday or weekend would work best for your testing time, you will have many more options to choose from. The test content and scoring haven’t changed. The test will contain all the same components (multiple-choice English, reading, math, and science tests, along with the optional writing test) and the same scoring system. The only thing that’s changing is the way the test is delivered. Why that’s great: You can still prepare for the ACT the same way students always have—by taking challenging classes and studying hard, and (if you want) taking advantage of free and paid test prep from ACT, or help from ACT-licensed tutors. All ACT test prep tools apply to either format of the test, so there’s no need to change your prep plans. And universities will accept your ACT score no matter how you took the test. CBT tools make the testing process smoother. CBT offers tools to help students do their best while taking the test, including enhanced navigation, magnifying glass, line reader, answer eliminator and masking, text highlighter, and flagged questions. Why that’s great: These tools help you eliminate answers you know are false, focus on certain parts of text, flag and quickly navigate to questions you want to recheck, closely examine graphs and charts—tools you can use to do your best. Typed answers to the writing test. Instead of writing out your answers to the optional writing test on paper, answers are now typed into the computer and scored online. Why that’s great: Most students are more used to typing rather than writing longhand, making CBT a more student-friendly way to do your best on the writing test. For many students, typing is faster and makes rewriting and editing simpler.